Of the five species of caiman that inhabit South and Central America, the Spectacled Caiman is the most widely distributed. These forms used to be extremely common in the Amazon and other large water courses in South America, where populations have been recently decimated by hunting. Relatively little is known about their feeding habits: as far as reported, they mainly subsist on fishes but will take other small animals as available. 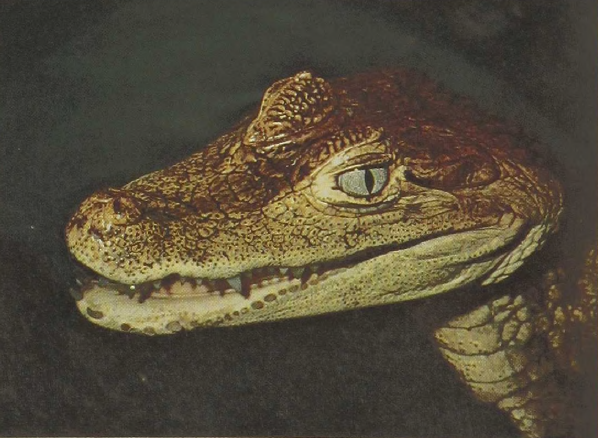 There is good indication that small Caimans are occasionally taken by the Anaconda, a large aquatic snake. Healthy adult animals are ordinarily not bothered by Piranha even though they often share the same water courses. Recent records average slightly more than 6 feet in length, but earlier records suggest that specimens used to grow larger.